The Exotic Animals Nail Polish collection is inspired by nature's wonderful colors to leave your nails beautiful and healthy. There are many vibrant and bright colors, each one dedicated to a specific exotic animal from all over the world. Ingredients: Butyl Acetate, Ethyl Acetate, Nitrocellulose, Tosylamide/Epoxy Resin, Alcohol, Tributyl Citrate, Stearalkonium Hectorite, Solum Diatomeae, Isopropyl Alcohol, Lecithin, Maleic Acid, Benzophenone-2. May contain (depending on shade): CI77266, CI77019 (MICA), CI77891, CI77491, CI77510, CI15850, CI45380, CI19140, CI15850, CI77891, CI77491, CI15880,CI77163, CI15850, CI77288, CI77499, CI77861. The Gold-faced Lion Tamarin is a species at considerable risk of extinction. They are very family-oriented animals: they live in groups and both parents share different tasks to care of the yearly twins. It brings the bright golden brown shade of its fur to the Surya Brasil Nail Polish collection. The Flamingo lives in areas of the Caribbean, South America and Central America, and it's Trinidad and Tobago's national bird. It brings its bright pink shade to the Surya Brasil Nail Polish collection. The Orangutan spends most of its life in trees. Its name means, in Malay language, 'person of the forest'. It brings its unique reddish brown color to the Surya Brasil Nail Polish collection. The Red and Green Macaw is a gorgeous native bird from the Amazon Rainforest and is considered very romantic: when it finds a partner, they mate for life and their union can last up to 60 years. It brings its intense red to Surya Brasil Nail Polish collection. The Jabiru is the symbol of the Pantanal region of Brazil. It may reach over 9' of wingspan and weigh almost 20 lbs. Its body's metallic white color is also part of the Surya Brasil Nail Polish collection. Known as the Ghost Tiger in India, the White Tiger is a threatened species: there are only about 500 animals on the planet. 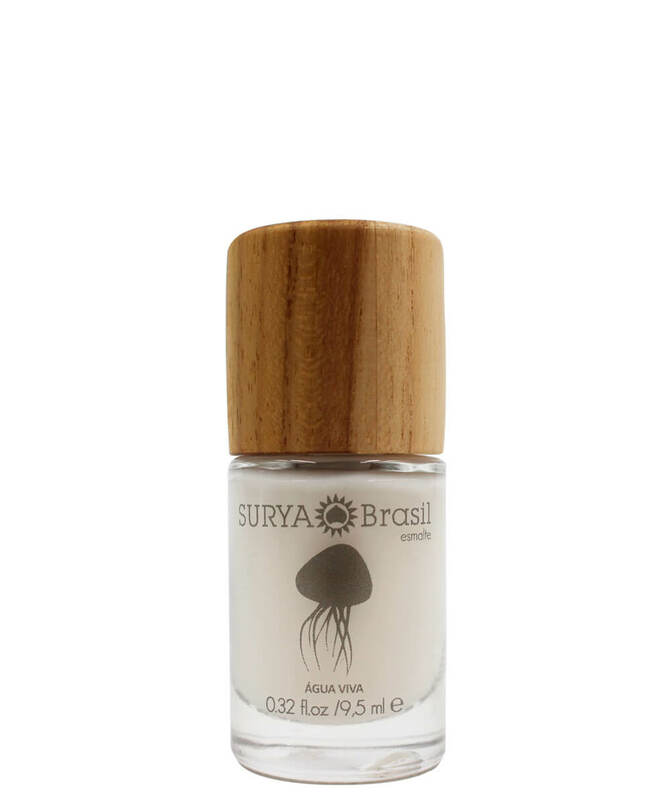 It brings its white color to the Surya Brasil Nail Polish collection. The Giant Anteater is the largest species of its family. It is recognizable by its elongated snout, bushy tail, and distinctively colored fur. It brings its dark brown shade to the Surya Brasil Nail Polish collection. Currently classified as a near-threatened species, the Pampas Cat is very similar to the domestic cat. Its fur can have different colors, varying from rusty-brown to grayish-orange. This one brings its tan shade to the Surya Brasil Nail Polish collection. The Amazon River Dolphin lives in the Amazon and Orinoco Rivers and it's the largest species of river dolphins. It brings its delicate pink skin shade to the Surya Brasil Nail Polish collection. The Hummingbird species that inspires this shade is the Green-Crowned Brilliant, found in Costa Rica and Ecuador. This beautiful bird is just 5.1 inches long and brings its aqua green color to the Surya Brasil Nail Polish collection. The Dark Blue Angelfish is very rare and can be found only in the Fiji Islands. It brings its deep blue shade to the Surya Brasil Nail Polish collection. The Peacock is one of the most exuberant animals in the world. It brings the bright metallic blue shade of its feathers to the Surya Brasil Nail Polish collection. The Chameleon's beauty is mainly it's camouflage ability: it changes color to hide from predators or to attack its prey. It brings the metallic green from its skin to the Surya Brasil Nail Polish collection. These polishes are amazing; they glide on nice and thick and last for a good while and I love the variety of colours!